These two pictures are of the same dog. It is kind of a Cinderella story. In the first picture, this sweet dog had been picked up at the shelter as a stray and described as a black and tan terrier. 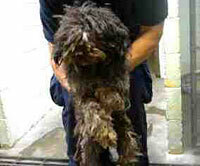 Her face was hidden under matted dirty hair, and the rest of her was so matted, she had to be shaved down to the skin. This is how she looked when I first saw my new foster dog. The next picture is Candy (her new name given by me) after two weeks of care, good food and a professional grooming session. 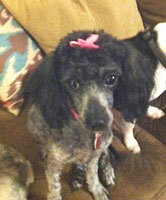 She turned out to be a beautiful little black poodle. She has now found her forever home. I think she knows now how beautiful and loved she is. Click on the names in the left column to read more fantastic foster stories! For more information on our foster program, please download our foster brochure and our Foster Flyer.